Spring has sprung and that means Easter is on its way. 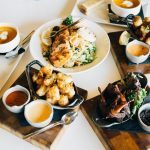 With the craziness of the just past holiday season and Valentine’s Day, it can be hard to wrap our minds around yet another occasion in which we prepare meals, buy gifts, and try to create memories for our families. Daily Mom is here to help you get what you need to make this Easter one of the best, with some of the most essential items. 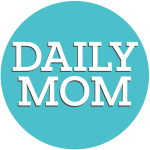 From planners to get yourself organized to the perfect dishes to help create tasty meals, Daily Mom has you covered. How will you set your Easter table? 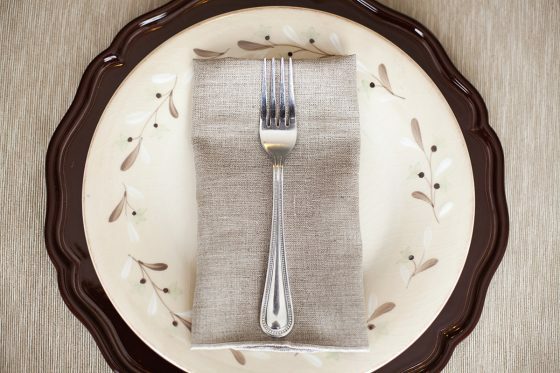 A good place setting doesn’t have to be complicated to make a huge impact. Dinnerware by Fiesta is the best way to create a beautiful table without a lot of fuss. Fiesta is loved for its flexibility. 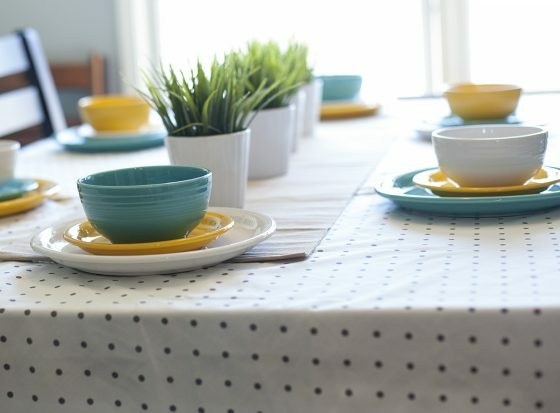 The ability to mix and match colors is what has made these place settings so popular. There are endless color combinations that would brighten up any Easter tablescape, but we chose turquoise, white, and a new color coming in June 2017: Daffodil. All of the colors offered by Fiesta are vibrant and festive! Various sets are available, each offering a number of different pieces, but the 3-piece bistro set is very affordable and offers a modern twist on formal dinnerware. We love that this dinnerware can be dressed up for special occasions, but is still completely appropriate for everyday use. All of Fiesta’s dinnerware can go from freezer to oven, fridge to microwave, and directly into the dishwasher when it’s time for cleanup! 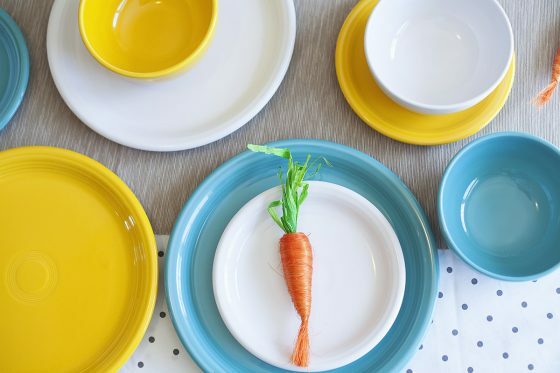 When you have the right set of dinnerware, creating a beautiful Easter tablescape is a cinch. Dinnerware by Fiesta is a simple way to make a beautiful statement. Fiesta launched in 1936 by Frederick Rhead and the Homer Laughlin China Company and is made in the USA. 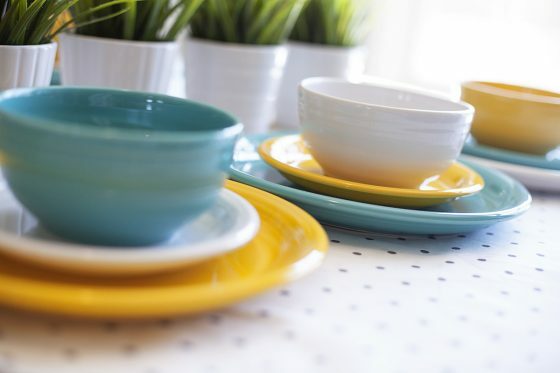 New colors are introduced each year, and Fiesta has become a leading dinnerware brand. Fiesta is a tradition, but has also become a trendsetter of color for the housewares industry. Easter brunch is not complete without a beautifully set table. The linens in particular can turn any normal table into a spring-inspired feast. This year, we are loving the boho-chic block printed textiles of Pacific & Rose! 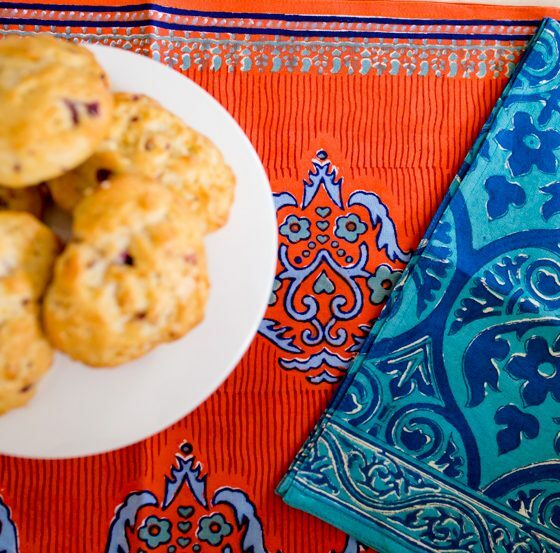 Combining the bright colors of sunny California and intricate designs reminiscent of India, Pacific & Rose provides everything from tablecloths to kitchen towels, napkins, and much more to decorate your home and kitchen. Embrace cooking this holiday with a kitchen towel that not only does its job, but also wows you and your guests. The Jack Kitchen Towel, featured in various tones of blue, is 100% cotton and block printed in India for a unique, custom design. Mix and match it with another of Pacific & Rose’s kitchen towels, such as the James Kitchen Towel, featured here in a beautiful orange and blue block print. Don’t be too afraid of their beauty – they work and wear just as well. The kitchen towels are machine washable and even come with a convenient twill hook for hanging and easy access. 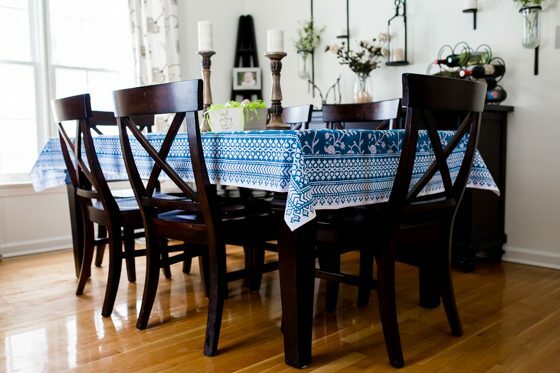 Once you’re done in the kitchen, don’t forget to set the table with the perfect flowery spring blue tablecloth! 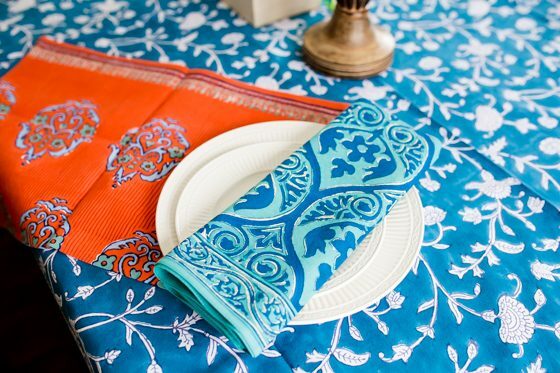 The English Teal Tablecloth features an Indian inspired floral design in bright blue and white and an intricately detailed border wrapping around the entire tablecloth. 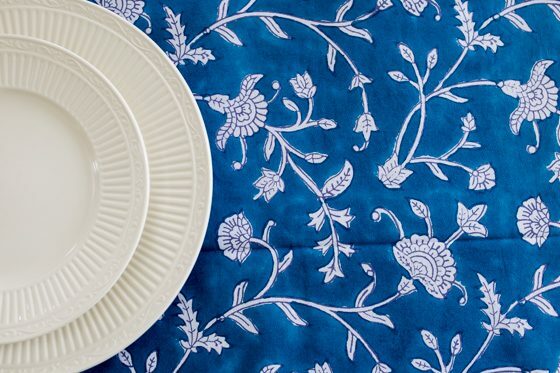 Also hand block printed in Jaipur, India, the tablecloth is 100% organic cotton and machine washable – perfect for a brunch that’s bound to be a little messy. 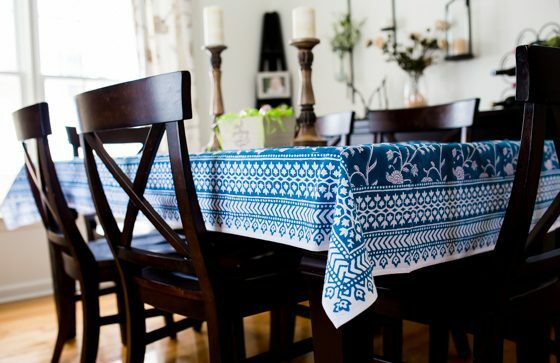 If coordinating prints is your thing, matching table runners, napkins, and placemats are available. A beautiful table setting is the perfect foundation for an Easter brunch with family and friends. Welcome spring into your home with bright colors and beautiful design. Pacific & Rose was founded by Elizabeth James after an inspirational and life changing trip to India in 2001. After witnessing the ancient art of hand-block printing, James brought back the idea to her California home, infusing both the California lifestyle with the intricate and beautiful designs of India into a textile company. James creates the Indian inspired designs and sends them to her workshop in Jaipur, India where the designs are hand carved into printing blocks. Each piece is handmade with the utmost quality and care, often taking weeks to complete. James ensures that the entire process from start to finish is complete magic, sure to add a little something special to your home. This Easter, get a gift for everyone in your family to celebrate your faith. 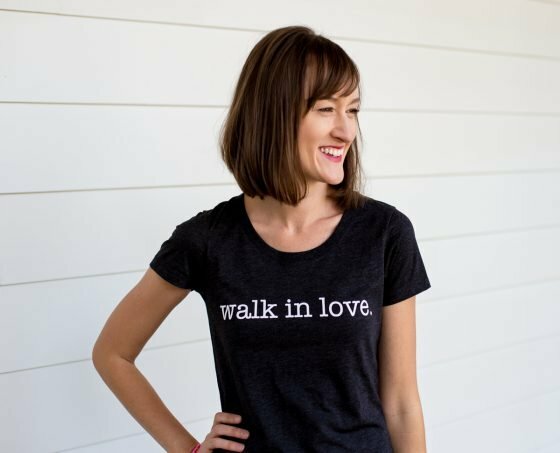 Graphic tees from walk in love will inspire you to remember to live out your faith and show the love that God freely shows to you and the world everyday. In our culture, the message of Christ can get left out during Easter in exchange for stories of the Easter bunny and marshmallow chickens. That doesn’t have to happen in your home. Make sure your Easter essential is something that will bring you back to the heart of this season. 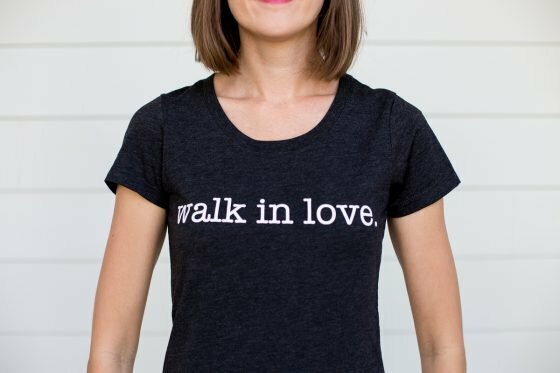 The walk in love Women’s Fitted Tee bears the original design that was the start of this wonderful company. The phrase comes from Ephesians 5:1-2, “Therefore be imitators of God, as beloved children; and walk in love, just as Christ also loved you and gave Himself up for us, an offering and a sacrifice to God as a fragrant aroma.” This tee is form fitting without being too tight. 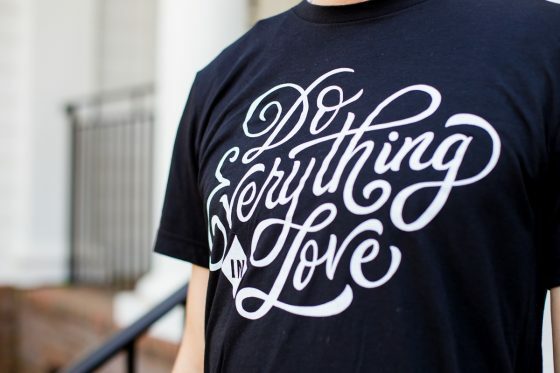 Remind yourself to love everyone everyday in this simply designed tee. Get your husband the Do Everything In Love T-Shirt this Easter. The design from this shirt comes from 1 Corinthians 16:13-14, “Be on your guard; stand firm in the faith; be courageous; be strong. 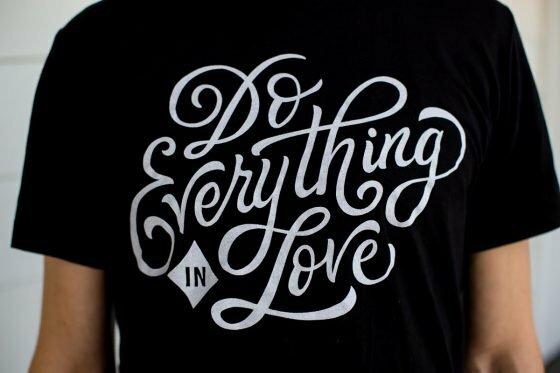 Do everything in love.” He will want to wear this shirt all the time, not just for the wonderful message but because it will be the most comfortable t-shirt he has ever owned. 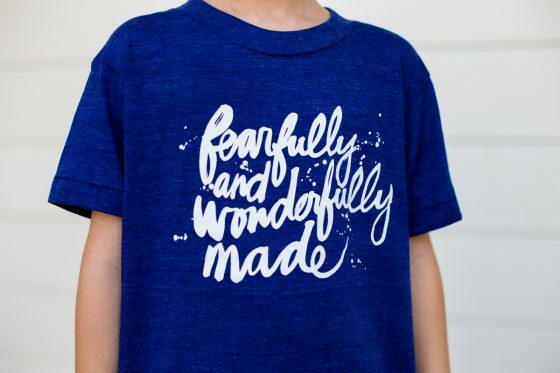 Of course you know your child is fearfully and wonderfully made. 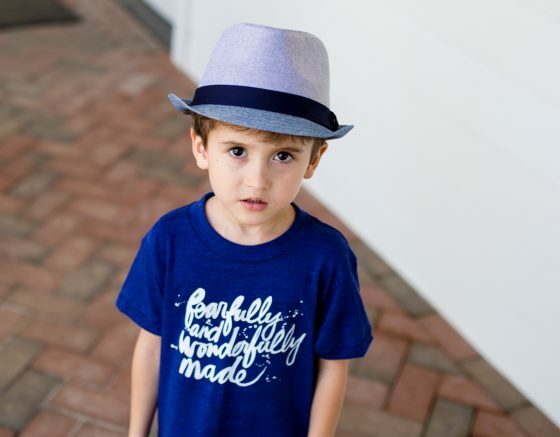 Let him know with the Fearfully + Wonderfully Made Kid’s Shirt from walk in love. This popular phrase comes from Psalm 139:14, “I praise you because I am fearfully and wonderfully made; your works are wonderful, I know that full well.” Give him confidence to walk through his days knowing he is a child of God, created for something great. 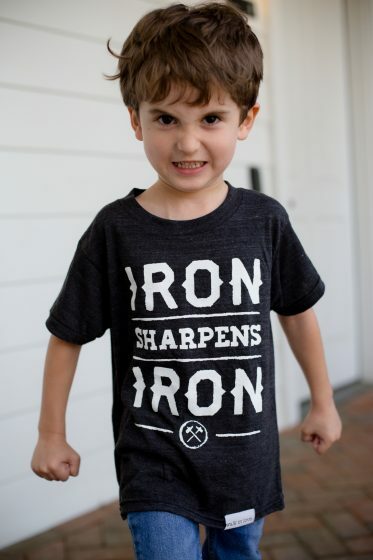 Let the world know that your son is a fierce little man of God, ready to call out greatness in those around him with the Iron Sharpens Iron Kid’s Shirt. From Proverbs 27:17, “As iron sharpens iron, so one person sharpens another.” This verse is about how we need to build each other up in our faith. Speak that powerful truth over your child everyday and he will grow to help others grow stronger in their faith. 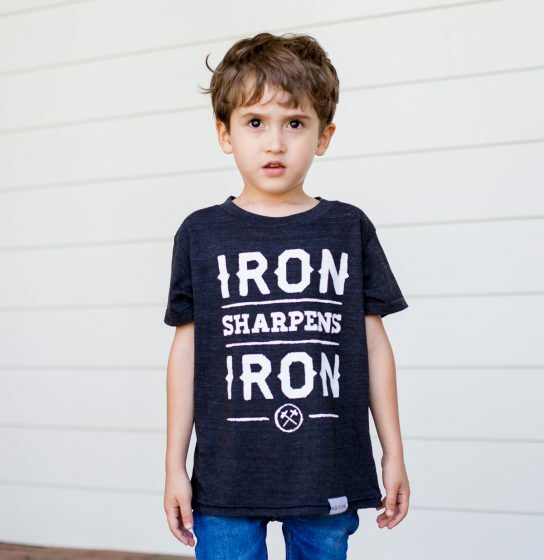 Graphic tees from walk in love inspire your family to live out the life you were called to as Christians in the season of Easter. walk in love was created in 2005 as a way to raise money to travel to Russia for a missions trip. 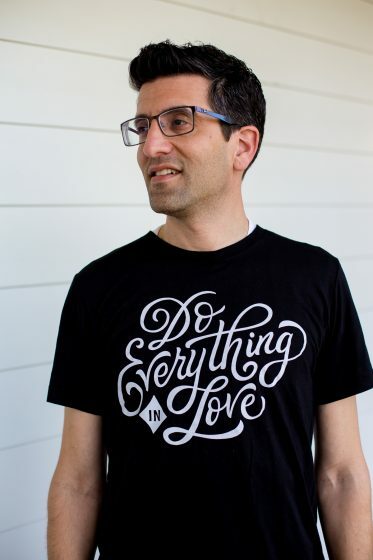 Creator T.J. Mousetis sold 100 royal blue shirts with “walk in love.” printed on the chest. 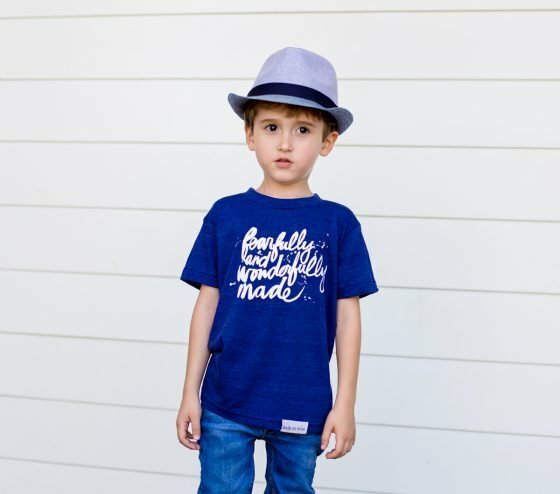 From that original design, this company was born and now features tons of designs that will inspire you to love others as Christ has loved us. The positive messages on their shirts are a breath of fresh air in a not so positive world today. In addition to the softest t-shirts, they also offer buttons, stickers, prints, magnets, and more. 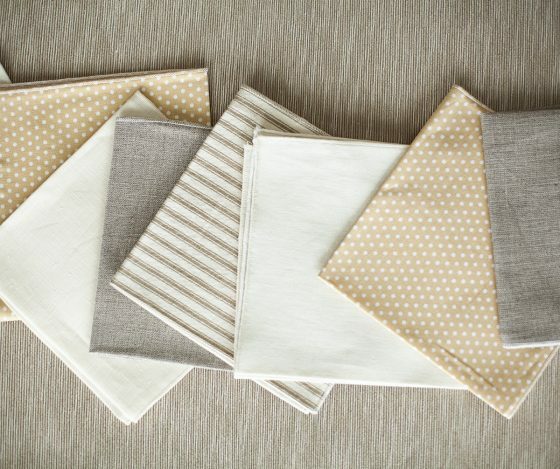 If you are looking for an easy way to dress up your Easter dinner, we suggest cloth napkins by Dot & Army! 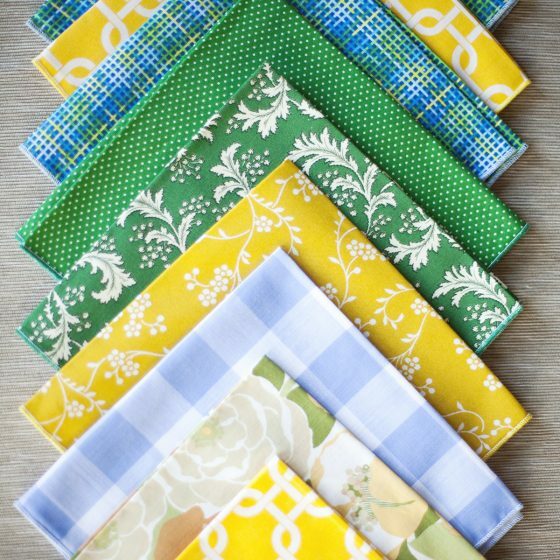 These napkins are a fun and eco-friendly way to make Easter dinner more beautiful. Dot & Army offers many different bundles with varying color combinations, fabrics, and sizes. 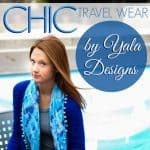 They are sure to have something to match your Easter decor or dinnerware. 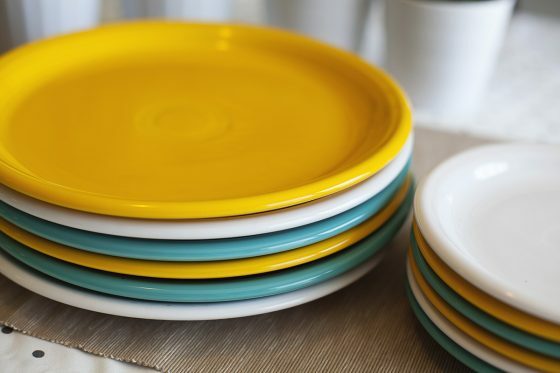 Select something like the Blue, Green, and Yellow Bundle to add a pop of color to your place setting, or stick with the Neutral Bundle to keep things a little more formal. Make your Easter dinner special! 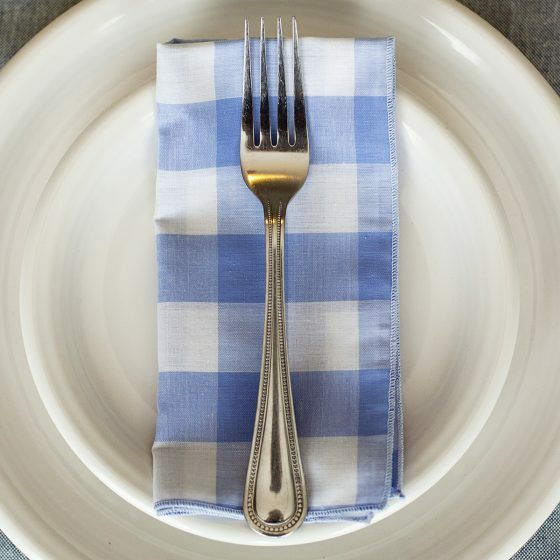 Cloth napkins are the perfect addition to an Easter place setting. 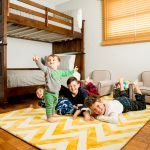 Dot & Army is a woman owned, cloth-napkin-obsessed company based in coastal Georgia. The company launched in 2013 with their seersucker napkins and quickly grew. Whether it be for special occasions or everyday use, they believe that cloth napkins can add something special to every shared meal. The company is run by Jennifer Zamudio, who named the company after her grandparents. 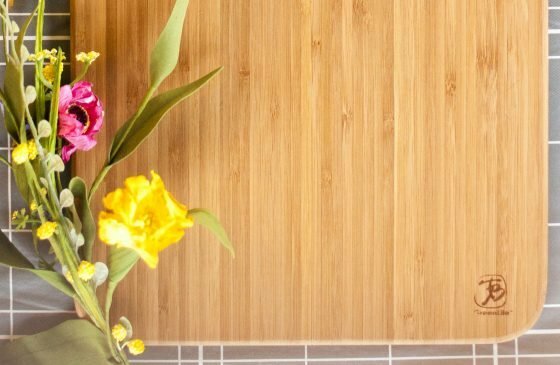 Bamboo has become one of the most popular materials for cutting boards because it’s virtually maintenance free. Even so, manufacturers normally advise against putting your bamboo cutting board in the dishwasher . . . that is, until now! The GreenLite Collection by Totally Bamboo is dishwasher safe! When it comes to food prep during the holidays, this is music to our ears. It’s worth mentioning again: this bamboo cutting board can go in the dishwasher! The board features a tri-ply cross laminate construction with an adhesive that was formulated to withstand the high temperatures of dishwashers. That means one less thing for you to wash on Easter Sunday. The medium paddleboard is our pick for family gatherings and special events because the handle makes it easily portable. 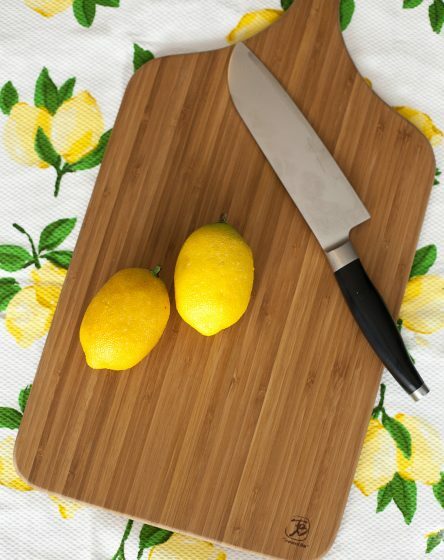 Having a quality cutting board makes it easier to prep food for Easter dinner. 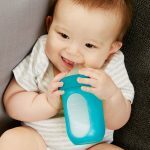 Totally bamboo offers a solution that is not only convenient, but dishwasher safe! Husband and wife team, Tom Sullivan and Joanne Chen, owned a business known for luxury customized director chairs. In their quest for a lighter chair, they experimented with bamboo, known for its strength vs. weight ratio. 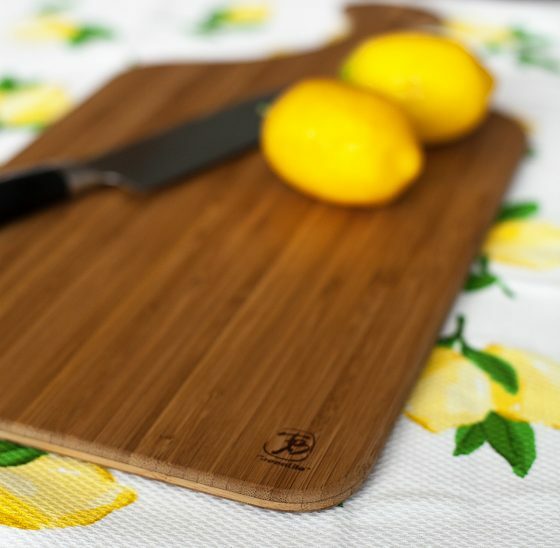 After that, they set out to design various house ware products with their “engineered bamboo” and created the world’s first bamboo cutting board. Shortly after, Totally Bamboo was born. Totally Bamboo has made it a goal to change the way the world uses bamboo. Chocolate is a classic Easter basket item, but that chocolate is anything but good for you and your kids. With so many families now eating healthier and choosing a paleo diet, we need new options for our Easter baskets. 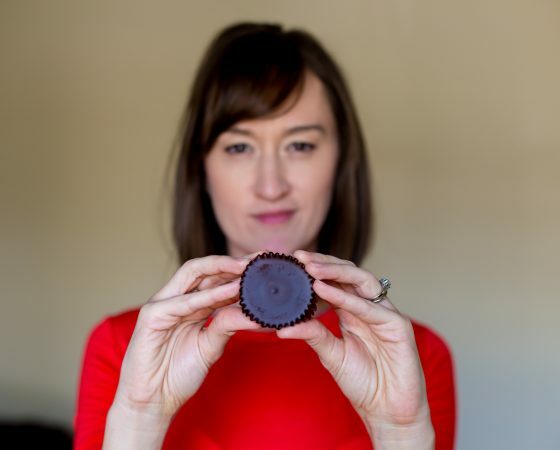 Eating Evolved rethinks chocolate, offering chocolate as a healthy food, not a junk candy. Let the bunny bring you something smarter this year by choosing chocolate from Eating Evolved. Primal Chocolate from Eating Evolved changes the way we approach chocolate. Chocolate is a food, not candy! It does not need to be full of milk and corn syrup to taste delicious. In fact, chocolate in a more natural way actually has health benefits and still tastes fantastic. Once you switch to eating chocolate this way, you won’t miss the syrupy sweet stuff you find in check out lines at the grocery store. 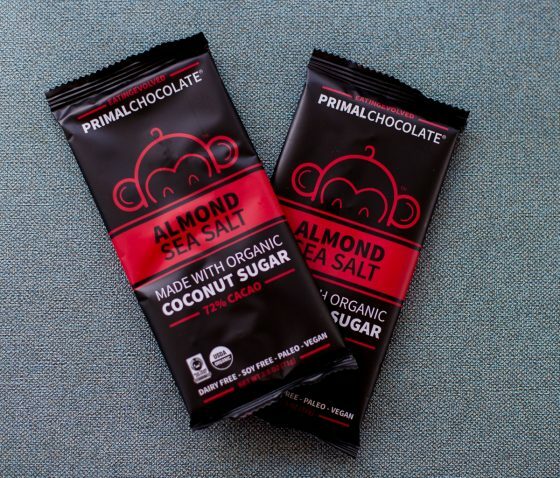 Try the Primal Chocolate Almond Sea Salt Bar from Eating Evolved. 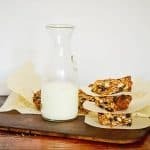 This chocolate bar is dairy free, soy free, paleo, and vegan friendly! Inside this chocolate bar, that is 72% cacao, you will find organic almonds and Himalayan sea salt making for a savory and slighty sweet combination that is addictive. 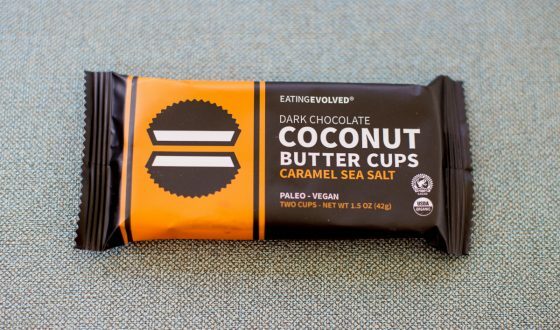 Coconut Butter Cups from Eating Evolved put all other “butter cups” to shame. These dark chocolate creations are rich and wonderful. The Caramel Sea Salt flavor is salty and sweet. Eating Evolved offers four flavors of Coconut Butter cups including Banana Cream, Classic, and Mint Cream. Please take our advice and skip the drug store candy this year. These cups are the cleanest on the market. Yes, you can eat clean this Easter, thanks to Eating Evolved. 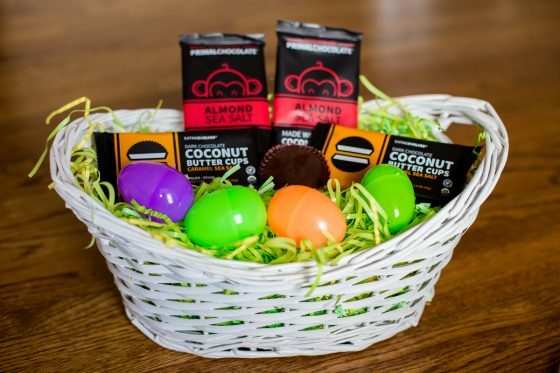 Eating Evolved lets you include chocolate in your Easter baskets even if you eat paleo or have certain food allergies. Eating Evolved is on a mission to offer chocolate to the world as a food, not candy. This is because they know that chocolate, when done right, is an antioxidant-rich super food. All their products are free of gluten, dairy, soy, and refined sugar. Everything is also paleo and vegan. They offer chocolate bars, chocolate cups, hot chocolate, chocolate spreads, and coconut butter. Crunchy mamas, fear not! You have found a company that has you in mind with everything they make. This chocolate is clean, delicious, and safe for your precious family. 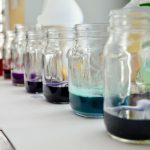 Do you have a creative mind living with you? 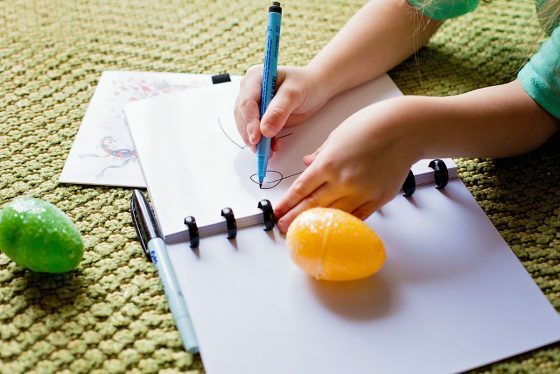 Be it yourself or your little human, Easter is an excellent time to encourage any form of artistic talent. 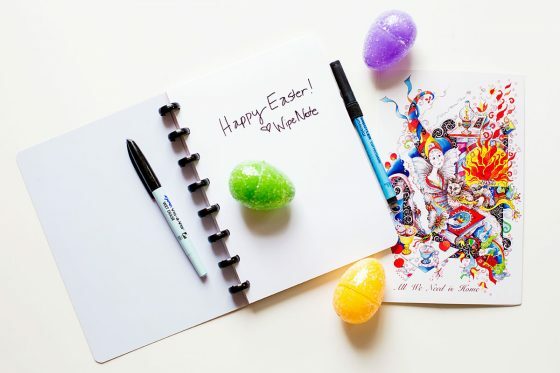 Perfect for inspiring your child, Wipenote‘s reusable whiteboard notebook is a gift of passion for any artistic, creative mind – young or old. 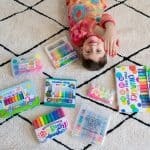 You can easily write, draw, and wipe away everything from practicing letters to creating works of art on 50 reusable pages as much as you’d like. Even better, you can remove pages, rearrange, copy, scan, and put the pages back in to create all over again. 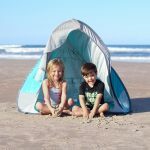 We love it so much, we strongly recommend that you get one for yourself and your kid. This beautiful dry erase notebook works great in any situation that your child would normally be reaching for screen time – in the car, at restaurants, waiting for an appointment, etc. Practical, tech-free, and good for the environment, it’s hard to believe we’ve gone this long without one. 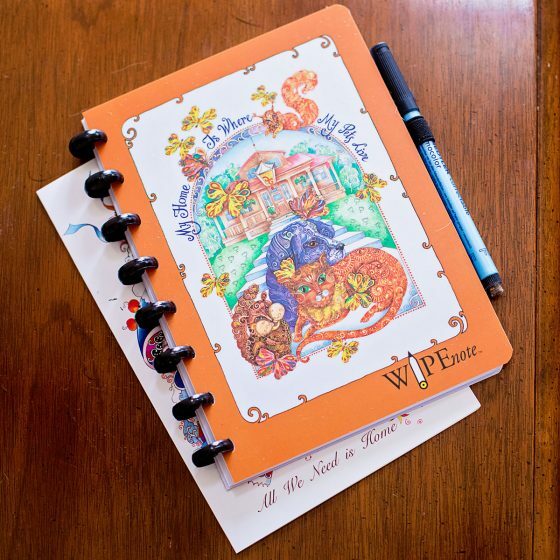 Whether your child is a skilled artist, or simply practicing writing letters, WipeNote is the perfect gift to inspire anyone and everyone over and over again. 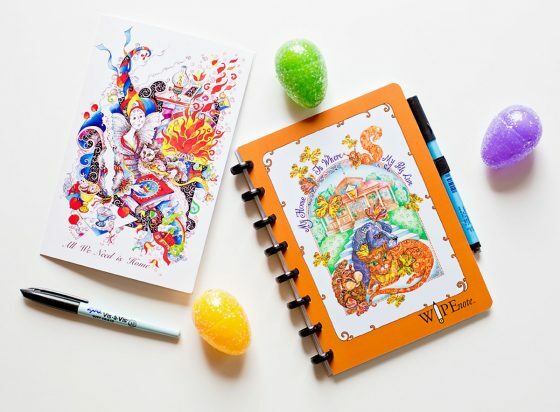 Founder Raymond Nutautas created WipeNote with the inspirational idea to showcase the enormous talent of new and worldwide recognized artists in everyday products. Originally, as a collector of graphic art and paintings, Nutautas crafted a platform that not only welcomes aspiring artists, but helps them to share their work with the wider public. Whether you’?re a skilled artist or feel like expressing your imagination, WipeNote provides a reusable platform that inspires artists of all ages to create. 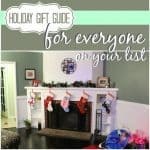 Easter is one of those holidays that can sneak up on you fast, but with this Essentials Guide from Daily Mom you will be prepared to host a beautiful meal, get some thoughtful gifts, and show that Easter is more than just about the Easter Bunny. Now planning Easter will be a breeze with these tips, tricks, and ideas from Daily Mom! 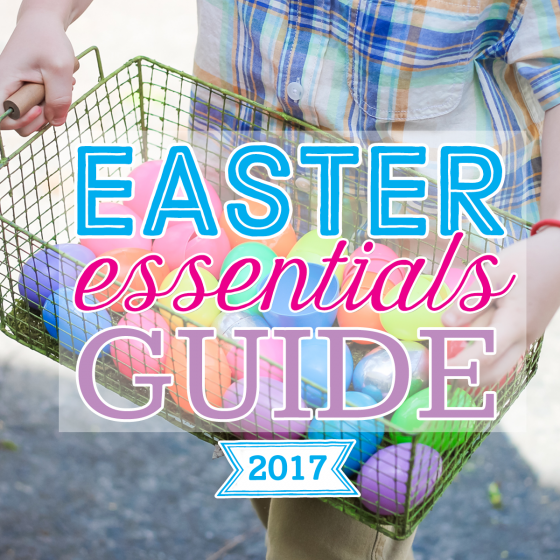 Be sure to check out our other 2017 Easter Guides for more ideas on clothing, gifts, meals, and more! 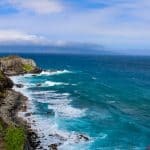 We are a team of fun loving, web combing, baby wearing moms and dads who saw a need for a website where we could share all the useful tips we come across daily. Modern mothers need one place where they can learn how to raise a baby, cook a meal, build a fire, save some money and then spend it, and do it all while looking perfect and being green.Ok, who are we kidding? It would be impossible, but we still try.Daily Mom will bring to you everything that can be of use to any mom and mom-to-be. We are here to educate, laugh with you, and make your lives easier (or harder depending on how many crafts you decide to do).